What happens when the Boyd girls start collaborating on an illustrated story? Magic — and some product-placement marketing for a local donut shop. Three cheers for Peggy Kaye and her excellent book Games for Writing which inspired the day’s writing games. 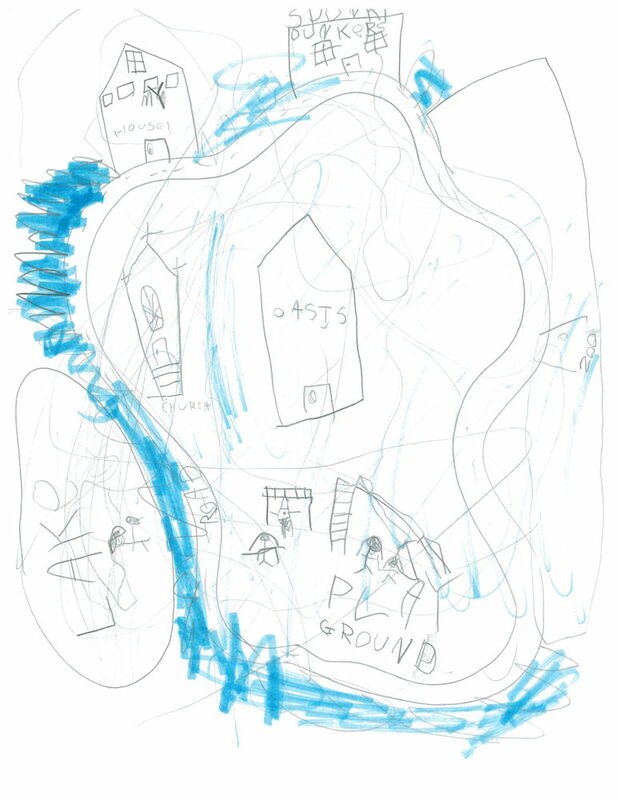 Rosie and I started off by making a “story map,” designed and lettered exclusively by Rosie. 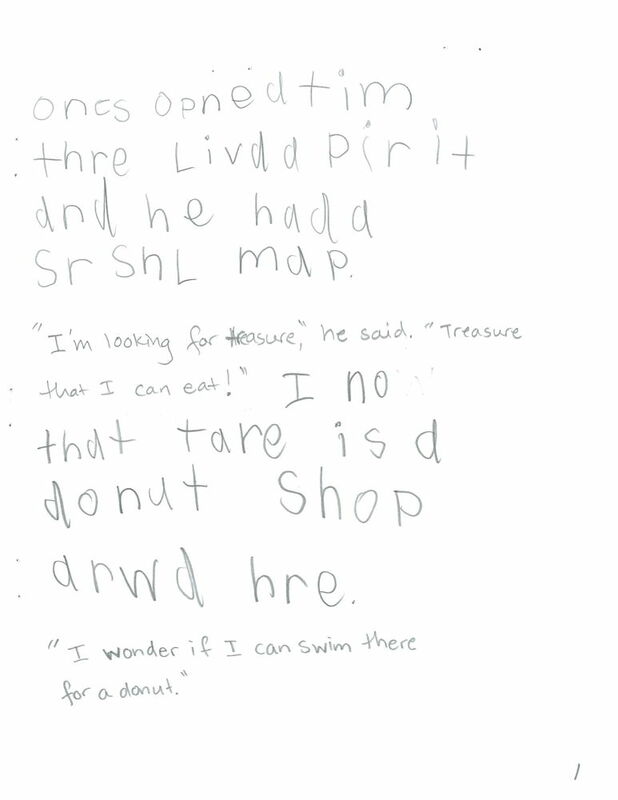 Then Lucy and I launched a story based on that map, each writing alternate sentences. Mama got the ball rolling, but the story belongs to the Boyd girls. 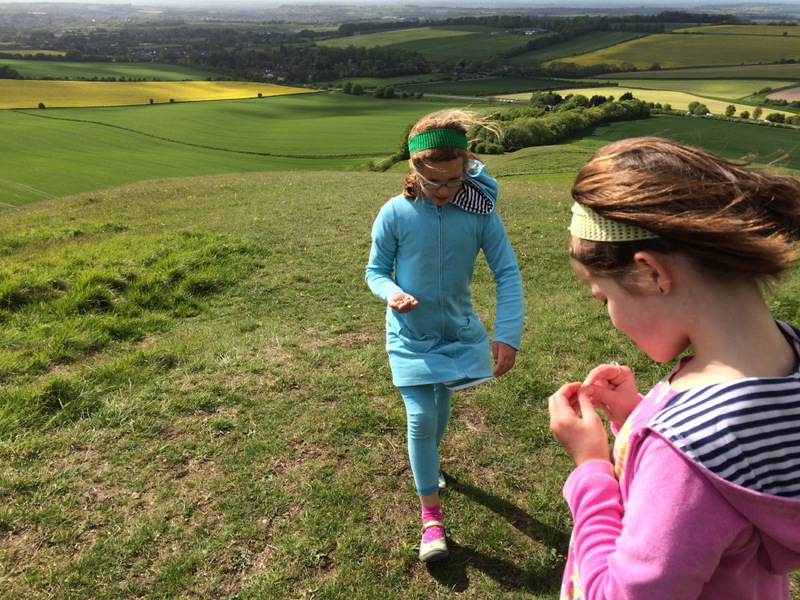 Then Lucy and Ann tag-teamed to write the following story. 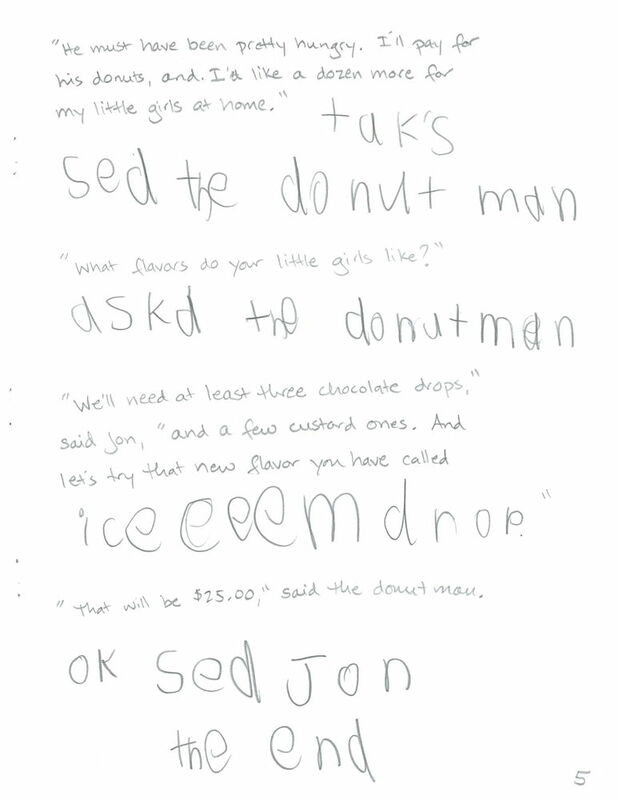 We’ve transcribed and standardized spelling and punctuation here, but for the quirky original, you can consult the manuscript itself at the end. I don’t know about you, but this is my kind of literary fun! 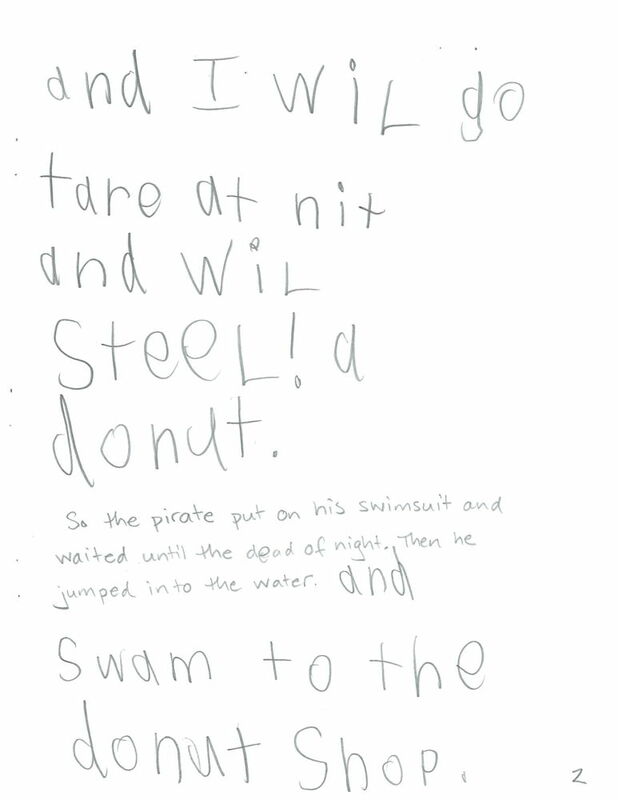 So the pirate put on his swimsuit and waited until the dead of night. Then he jumped into the water and swam to the donut shop. When he arrived he was surprised to see all the lights on at Spunky Dunkers. 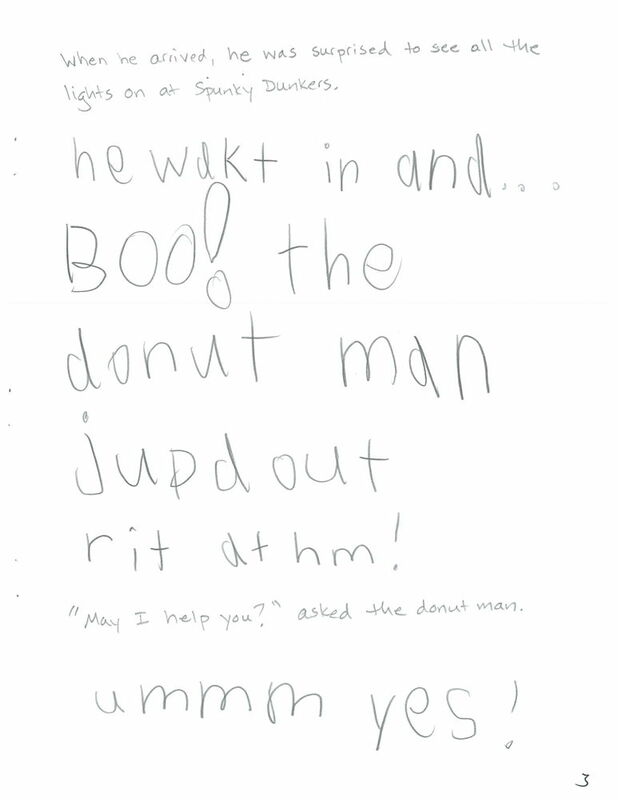 He walked in and… “Boo!” The donut man jumped out right at him! “May I help you?” asked the donut man. “Um, yes!” And the pirate jumped at the donuts and grabbed one and ran out the door! 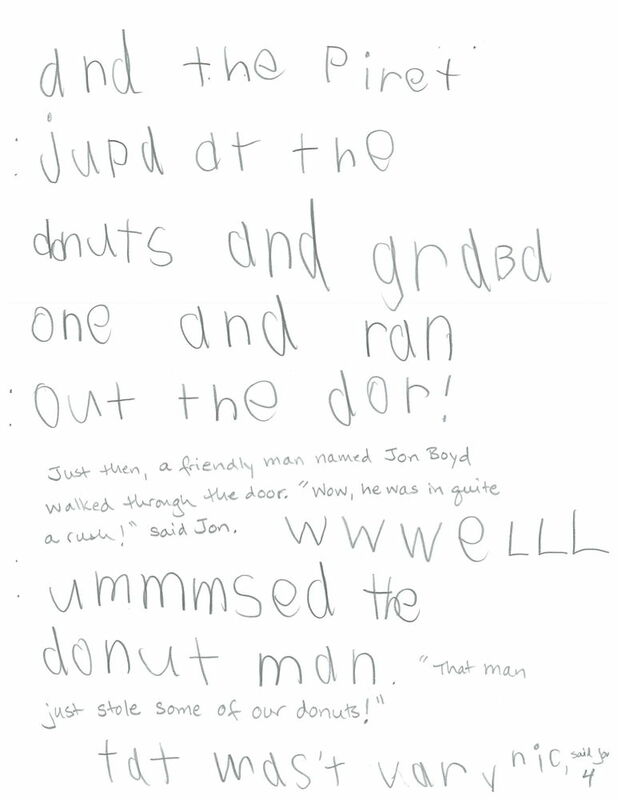 Just then, a friendly man named Jon Boyd walked through the door. “Wow, he was in quite a rush!” said Jon. “That wasn’t very nice,” said Jon. “Thanks,” said the donut man. “What flavors do your little girls like?” asked the donut man. “That will be $25,” said the donut man. What a great idea for the camp! The girls have made a few other story maps, and I’ve heard of people making little paper figurines to go along with them. Beats the heck out of Candy Land!